New research confirms a criticised 2015 study which overturned results of a “pause” in oceanic warming. 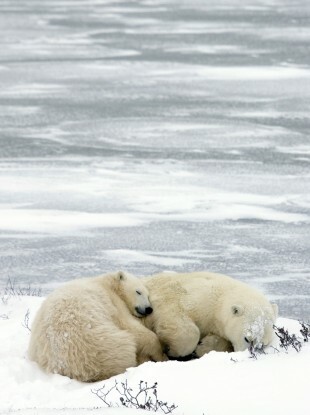 File photo of a mother polar bear and her cub sleep near the ice outside Churchill, Canada in 2006. NEW RESEARCH HAS undermined the idea of a “hiatus” in the warming of our oceans, which have continued to heat up without pause for the past 75 years. A reported pause in global warming between 1998 and 2014 was false, according to US-British research that confirmed the findings of a 2015 US study on ocean warming that was criticised by climate sceptics. Scientists at the University of California, Berkeley, and the University of York, England, corroborated the results of the National Oceanic and Atmospheric Administration’s (NOAA) research paper in 2015. Their findings were reported in the US journal Science Advances. The NOAA paper had shown ocean buoys now used to measure water temperatures tend to report slightly cooler temperatures than older ship-based systems. The switch to buoy measurements had hidden some of the real-world warming during the 1998-2014 period, the NOAA scientists concluded. The NOAA paper had drawn outrage from some scientists who insisted there had been a “global warming hiatus”, and from critics who consider global warming a hoax. The US House of Representatives, controlled by the Republican Party, had even demanded the NOAA scientists provide lawmakers with their email exchanges about the research. The US government agency agreed to transmit data and respond to scientific questions but refused to hand over the emails of the study’s authors, a decision supported by scientists worried about political interference. Our results mean that essentially NOAA got it right, that they were not cooking the books. The Intergovernmental Panel on Climate Change, in a report published in September 2013, said the average global warming between 1951 and 2012 had been 0.12 degrees Celsius (0.22 degrees Fahrenheit) per decade. Yet the 2015 NOAA analysis, which was adjusted to correct for the “cold bias” of buoy measurements, found there was no detectable slowdown in ocean warming over the previous 15 years. Reporting in the journal Science, the NOAA scientists said the oceans has actually warmed 0.12 degrees per decade since 2000, nearly twice as fast as the earlier estimates of 0.07 degrees per decade. That brought the rate of ocean temperature rise in line with estimates for the previous 30 years, between 1970 and 1999. The new study uses independent data from satellites and Argo floats, a worldwide satellite-based location and data collection system, as well as from buoys. The information gathered confirmed the NOAA results in 2015 were correct, the scientists said. We were initially skeptical of the NOAA result, because it showed faster warming than a previous updated record from the UK Met Office. “So we set out to test it for ourselves, using different methods and different data. We now think NOAA got it right, and a new dataset from the Japan Meteorological Agency also agrees,” he said. © AFP, 2016 with reporting from Darragh Peter Murphy. Email “It's official: The so-called hiatus in global warming is a myth”. Feedback on “It's official: The so-called hiatus in global warming is a myth”.